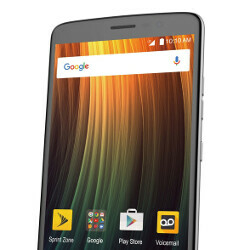 A bit more than a month ago, ZTE launched the sales of the Max XL over at Boost Mobile stores — an affordable smartphone with hardware that matches its sub-$200 price tag. The phone rocks a 6-inch, 1080 x 1920 resolution screen and is powered by the Snapdragon 435 chipset with 2GB of RAM and 16GB of expandable storage. Its cameras have a 13 MP sensor on the back and a 5 MP one for selfies, while the battery in the trunk is quite large at 3,990 mAh. Despite being a lower tier device, it still rocks a fingerprint scanner on its back and comes with Android 7.1.1 Nougat out of the box. The company now proudly announces that, after its "success at Boost", the phone will now be offered through Sprint as well, for the price of $192. No pricing options over different Sprint plans have been announced at the time. Additionally, ZTE announced two new smart devices — the ZTE Warp Connect and Sprint Phone Connect 4 by ZTE. The former is a $144 mobile hotspot, which can provide Internet connection to up to 10 different devices. It has a 2,300 mAh juice box to keep the lights on. The Phone Connect hooks up to your landline connection and transforms it into a mobile one, working over Sprint's network. It's a $120 device that allows you to take calls to your home while out and about. The Max XL, Warp Connect, and Phone Connect are available in Sprint stores now and should hit Sprint's web shop soon. Links provided below, but they are not live at the time of writing.